Children (sixteen and under) Free. Target sponsors MoMA every friday, "Target Free Fridays" from 4 - 8 pm. If you would like to view a film, don't forget to pick up a ticket at the ticket counter to view at no cost to you! Remember to keep your Museum entry stub along with your ticket to present to the ticket collector at the time of the film. When we think of the MoMA (Museum of Modern Art) we think of a variety of elements, including design, space, light, and freedom. The end of these elements is to achieve one common goal: an atmosphere and experience of oneness. It is the objective of art to bring the audience into the physical and mental or emotional space created by the medium being viewed. The MoMA is the perfect museum at which to explore the contemporary experience and notion of living in a space that is modern and designed for use. It is a sprawling space at which to spend a day and get away from the chaos and noise of the bustling and barreling city crowds and traffic. Without question, it is possible to spend an entire day wandering around the great white rooms, viewing walls laced with some of the best modern and contemporary art in the world. 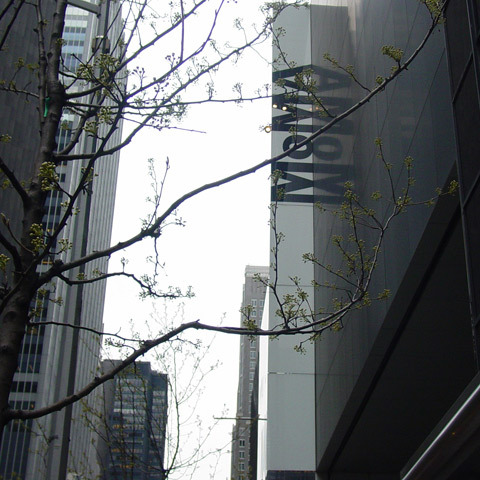 The MoMA offers visitors two cafes, as well as the five-star restaurant the Modern, at which they can enjoy a meal during their visit. Our favorite cafe, Terrace 5, which overlooks the beautiful sculpture garden, is another splendid place to enjoy refreshments near the fountain-side. For those visitors who love to shop, it will be nearly impossible to pass up the MoMA's great gift shop; it’s certainly not just for tourists. There are a number of gifts with an emphasis on the utilitarian aspects of the object, where every true art lover’s desire for an object to serve not only a purpose, but also exude aesthetic taste, or beauty, can be easily satisfied. Take for instance the “palette serving set” ($95; Members: $85); a white porcelain plate in the shape of a painter’s palette with a thumb hole for ease of carrying, it is a classic piece, elegantly combining the need to utilize an object that has character and style. It is a must have for any lover of painting and portraits; a gift that finely accents the current exhibition of entitled “Van Gogh and the Colors of the Night” (through January 5, 2009). Some of these gifts breathtakingly define the meaning of the phrase “form meets function” with exquisite harmony. The MoMA’s gift shop is perfect for those people whom selfishly thinking of themselves! The book-store is also a must see before leaving, full of books focusing not just on the current exhibitions, but also on permanent collections as well. Needless to say, there is something for everyone at the MoMA. Admission is free for all visitors during Target Free Friday Nights, held every Friday evening from 4:00 to 8:00 p.m. Tickets for Target Free Friday Nights are not available in advance. Your Target Free Friday Night ticket permits you to all other Museum galleries, exhibitions, and films. Please note: Film tickets may be obtained for same-day screenings at no charge by presenting your Museum admission ticket stub at the film desk. Target Free Friday Nights sponsored by Target.